Facebook is not just a social network as you can now do more than what it is used for. 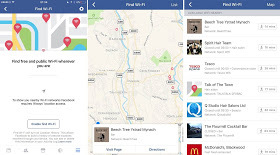 Facebook has introduced yet another feature called Wi-Fi Discovery that allows you to find free available and public Wi-Fi hotspots using the Facebook app. 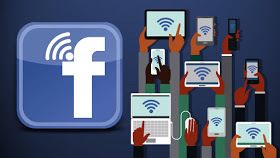 Wi-Fi Discovery by Facebook helps to highlight places where Facebook users can access free available and public Wi-Fi. Currently, the service is available in some selected countries and it'll be available worldwide coming next month, December 2016. The feature is currently available for the iOS users. => First of all, you have to activate your Location for the Facebook WiFi Discovery feature to work. => Scroll through the menu option to locate the “Enable Find Wi-Fi”. Toggle the settings to turn it on and the app will automatically detect the nearby free Wi-Fi. How do you see this feature from Facebook? A good one or Nay?